"The rise in hate crime since last summer is very worrying, and urgently needs tackling. Football clubs are uniquely well placed to take a lead on these kinds of issues because they are at the heart of their communities. I know that QPR take that responsibility very seriously." 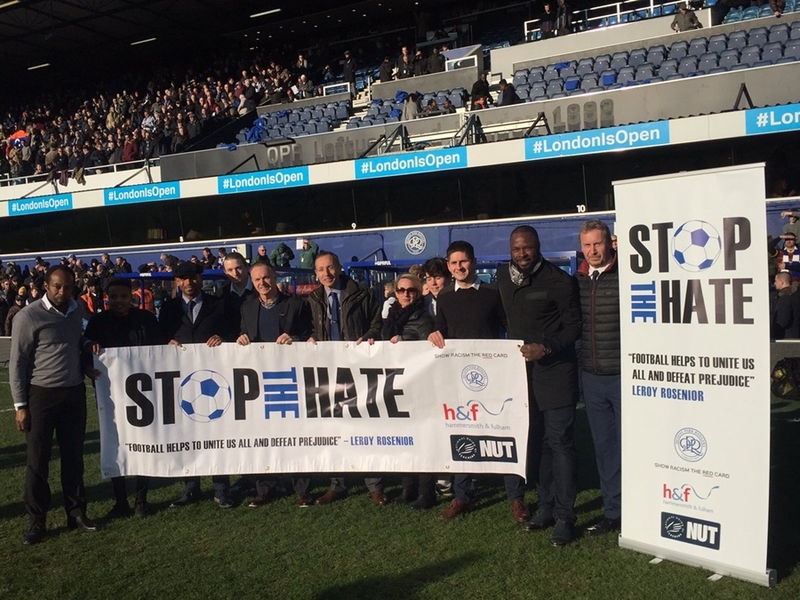 On Saturday 21st January Show Racism the Red Card launched a new programme in partnership with QPR in the Community aimed at tackling hate crime. The programme, devised with Hammersmith and Fulham council and the National Union of Teachers, will see SRtRC Educators work with QPR in the Community Trust coaches in local schools to educate children about the dangers of hate crime, and support them to reject prejudice in all its forms. The workshops will be followed up with an educational visit to Loftus Road, both funded by the Council, as well as teacher training funded by the NUT. Southern Region Manager Steve Goodsell commented: "As Show Racism the Red Card enter our 21st Year educating children on the dangers of racism and hate crime, we are delighted to be doing so working in partnership with QPR in the Community, Hammersmith and Fulham Council and the NUT." "Our joint 'Stop the Hate' educational initiative is truly innovative and will play a part in promoting community cohesion in the Borough of Hammersmith and Fulham, and in keeping its children safe"
QPR in the Community Trust and partner organisations were joined at Loftus Road for Saturday's game against Fulham by local MP Andy Slaughter and Cllr Sue Fennimore, as well as former QPR players Trevor Sinclair and Danny Shittu, to launch the new programme. "That's why they invited staff from the Polish Centre in Hammersmith to Loftus Road after they were attacked last year, and are making a return visit there to deliver one of the hate crime workshops." "It is also why they were the first London club to back Sadiq Khan's #LondonIsOpen campaign championing tolerance and unity in the capital. Football is more than just a game. Football clubs - professional and amateur - can be powerful community assets." "QPR understand the positive role they can play in their community, and the programme being launched today to tackle the scourge of hate crime is just the latest example." "Teachers and schools have a huge part to play in empowering children and young people to recognise prejudice and racism when it occurs and empowering them to stand up against discrimination in all its forms." "We are delighted that local teachers, school staff and pupils will be able to engage with Show Racism the Red Card's huge experience, resources and innovative approaches. The NUT nationally is a committed sponsor of SRtRC's work and we are proud to be supporting their work in our Borough"